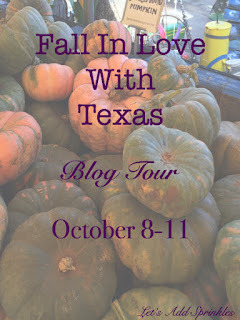 Welcome to my home for the Fall in Love with Texas Blog Tour. I've set our tea party on the patio since we still have nice days here in October. Would you like an applesauce spice cakelet? They are so moist and perfect for a Fall treat. I love using my Sadler Brown Betty teapot year round. I had a gift card to HomeGoods and I bought an Autumn Treats Pan by Nordic Ware, and Cissy, my granddaaughter, and I had fun baking the cakelets, with the recipe that came with the pan. Katie, from Let's Add Sprinkles, is our hostess. Thank you for organizing this for us! This is one of my favorite Fall teacups, which is Johnson Brothers, Harvest Time. Isn't it pretty, and with such a lovely, vintage transferware design? Bringing it out in the Fall is like seeing an old friend! My American Family Scale is a such fun accessory for my kitchen. I got this for $18 several years ago in a downtown McKinney antique mall!! These are moist, very flavorful cakes, and perfect for Fall! Cissy helped with them and grated the nutmeg. Prepare pan with spray or butter and flour (I like to use Baker's Joy). Blend butter, sugar and eggs together. In separate bowl combine flour, baking powder, soda, spices and salt. Slowly add dry ingredients to butter, sugar and egg mixture. Add applesauce and blend in vanilla. Divide evenly between each cake well. Tap on counter-top gently to remove air bubbles. Bake for 20-30 minutes or until toothpick inserted into cake ’s center comes out clean. Cool on rack for 10 minutes before turning out. Loving your tea tray, Kitty, and especially the lovely teacup. Cakelets is such a cute name. First I have heard the term. Those Nordic cake pans are terrific. A charming tea for you and Cissy. 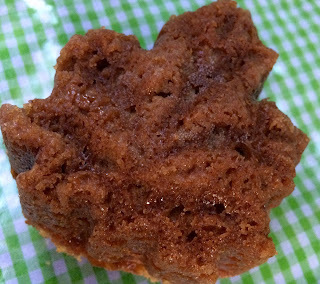 I imagine that this cakelet was like taking a bite of autumn. The applesauce cakelets, looks so yummy! Love Tea Parties.Love your teacup. When I was younger, I loved anything and everything with chocolate, and now I find I love anything and everything with either apples or berries. Your recipe looks so yummy and perfect for the Fall days ahead! Thanks for sharing, Kitty. Always something yummy coming out of your kitchen! Those cakes are adorable. I love apple cake. Your teacup, scale and apple candle are too cute. Thanks for being a stop on our tour. I love that Fall tea cup. I thinned out my tea cup collection yesterday but don't think I have one like that! Enjoy your day and thanks for the recipe! Yum! I suddenly feel some baking coming on. That is an adorable cup, too. I love anything apple or pumpkin...anytime, but especially in the fall! These little cakelets (love the name!) are so adorable baked in those cute little pans. 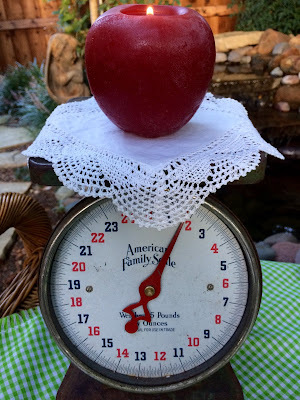 I love the big apple candle sitting on your kitchen scales...I have a vintage kitchen scale on my wish list for when we get into our farmhouse. Enjoy your week, Kitty! HUGS! Your setting is so pretty, Kitty. The cup and saucer is beautiful and the little cakes look sooo good. Thanks for all the good recipes you share with us. Oh Kitty your little cakes have my mouth watering! I love the sweet leaf shape. My son is off from school today and I bet he would love these. I too love that teacup pattern. Wish I could smell those cakelets! I am a cake eater and want to find a cake pan like that! So cute. Loved your setting. It's all so cute. And thanks for the recipe! Pinned and off to the grocery store! Kitty, the applesauce cakelets look delicious and perfect for this dreary, rainy day. I hope you are enjoying the rain as much as we are. I'm happy to just hold up at home and listen to the rain as I go about my day. Happy Autumn! Kitty, I love your Harvest tea cup. That pattern always catches my eye this time of year and makes me wish I had some. The applesauce cakelets have to be delicious! I love your pretty table setting and the applesauce spice cakelets look so good. Thanks for the recipe to make them. I'd love to try your applesauce spice cakelets. The brown betty teapot is so versatile and can be dressed up according to the seasons with a tea cozy. Your JB teacup is the epitome of fall. Kitty- you are such a good cook! I wish I was sitting in your kitchen so I could watch and learn. These look delicious and I wonder if they wouldn't work well in little mini-loaves pans. Your table setting is so welcoming to fall and I so wish it would hurry up and get to NE Louisiana. That teacup is stunning,Kitty!Delicious recipe!Hugs! This looks so wonderful! 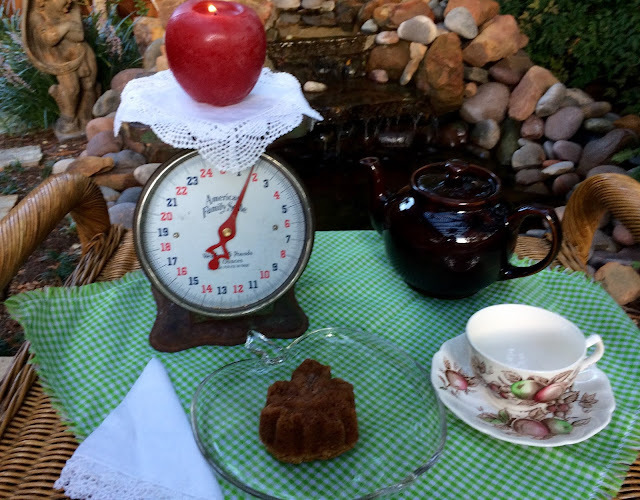 I make an apple cake for my dear mother-in-law, and I think she would love this recipe, also. She LOVES sweets! Bless her little heart, we try to make anything for her that she likes. So nice to visit with you tonight ~ it is always a blessing to come by here. Hi Kitty! YUM!!! Your applesauce spice cakelet looks really delicious!!! One of the things I didn't bring with me when we moved out to Texas in our small travel trailer was my mini Bundt pan. Now I wish I had! ;) Happily pinning your recipe to my Yummy! board for you and our readers. Thanks for this recipe and I'm happy to be part of the Fall In Love With Texas tour with you! Kitty, thank you for the applesauce cake recipe. Sounds wonderful on a cool fall morning ~ if we will ever get one! And your teacup is so sweet. Kitty, these are perfect for fall. I love small serving desserts like these - pinned, and thank you! I also love the Johnson Bros Harvest Time pattern too. I better not run into that at an estate sale or antique mall because I know I would cave and buy it, even though I absolutely do not need any more dishes! Kitty, what a beautiful little cake! I've seen those Nordic cake pans. Was it difficult to get the cakes out? Your recipe looks so delicious and I will surely try it! Love your tea cup, teapot, scale and little red candle apple! Enjoying some applesauce spice cakelets with tea poured from that teapot into your pretty Fall teacup sounds rather divine, Kitty. A right royal Texan tea party with the trees turning into glorious autumnal hues sounds quite delightful! such a cute little tea cake Kitty! I know you and Cissy had fun trying out a new recipe and a new pan! Your vignette is apple adorable! Thanks for the great reminder! I have a cakelet pan in the bake of the cupboard I had forgotten about! Guess what I am making today??! Love your scale and Johnson Brothers Harvest Time is a favorite! Thanks for linking to Tuesday Cuppa Tea! Love your cakelets, Kitty! Would love to have one right now with a steaming cup of tea from your Brown Betty. It's always inspiring to come see something pretty and take home a new recipe! I can't wait to try this yummy recipe and your teacup is gorgeous! The tour was great, I just didn't make it this year, but all the homes look beautiful! Your Applesauce Spice Cakelets look delicious, I love the spice mix!It is 46 degrees, cold and rainy here at the lake, sure hope you are staying warm and dry, it's chili bowl weather here! Thanks so much for sharing with Full Plate Thursday and have a great week! I love your pretty setting and cakelett Kitty!! Thanks for sharing it with SYC. Giveaway Gifts from Mary and a 1st Birthday!